Mars and Saturn from last night, both showing the benefits of a IR/UV cut filter. I'm also trying a new way to get better control of color balance. I've used Mars' polar cap as a white reference and the shadow of Saturn on its rings as a grey point. 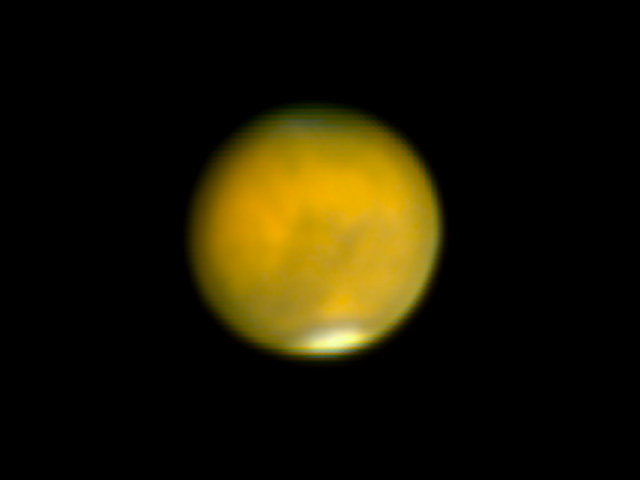 The southern polar cap of Mars is really standing out now. Every night conditions improve with more dust settling out from the dust storm. This is the Vallis Marineris side of mars and I can almost imagine seeing some sign of it. in Seeing in Austin was only fair. Questar 89/1350 mm telescope with Dakin 2x Barlow, UV/IR cut filter and ZWO ASI224MC planetary video camera. Taken 2018-08-07 05:36 UT from Austin, Texas. Exposed 17.5 msec at a gain of 200. The best 10% of 13,132 frames captured with FireCapture and stacked in Autostakkert 3 with 3x drizzle. Deconvolved in Lynkeos with final exposure white balance and crop in Photoshop. 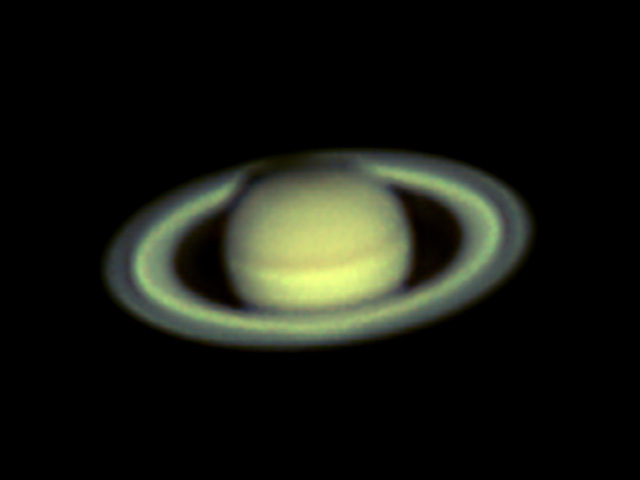 I'm getting more details from Saturn under similar conditions to a couple of nights ago, now using an IR/UV cut filter. I have an Atmospheric Dispersion Corrector on order and expect more improvement from it, especially if I get some good steady skies. Questar 89/1350 mm telescope with Dakin 2x Barlow, UV/IR cut filter and ZWO ASI224MC planetary video camera. Taken 2018-08-07 05:36 UT from Austin, Texas. Exposed 57.6 msec at a gain of 330. The best 15% of 3,127 frames captured with FireCapture and stacked in Autostakkert 3 with 3x drizzle. Deconvolved in Lynkeos with final exposure white balance and crop in Photoshop.